If you are looking to incorporate strength training into your fitness regimen, but don’t want to join a gym or break the bank on an expensive weight set, the PowerBlock Sport 2.4 Dumbbell is worth a look. I bought mine and have no ties to the PowerBlock company. Since it’s an adjustable dumbbell set, it’s a great space saver and money saver. Its strange design kind of makes it look like a dumbbell from an alien planet. It adjusts from 3 to 24 lbs(1.3 kg to 10.8 kg) in 3 lb increments, which should be sufficient for most people starting a strength-training regimen, including jogglers. There are much heavier PowerBlock adjustable sets for those who are into bodybuilding, or need heavier weights, however, I only have experience with the PowerBlock Sport 2.4, the lightest set(they all have the same basic design). The concept of combining light weights to form a heavier weight isn’t exactly revolutionary, so it’s not unique to the PowerBlock. A similar product that I almost bought is the Bowflex SelectTech 552 Adjustable Dumbbells(50 lbs each at maximum weight), and you can read an excellent review of them at All Seasons Cyclist. I have a little experience with the Bowflex adjustable dumbbells, but mostly at sporting good stores – they seem a little sturdier than the PowerBlock. 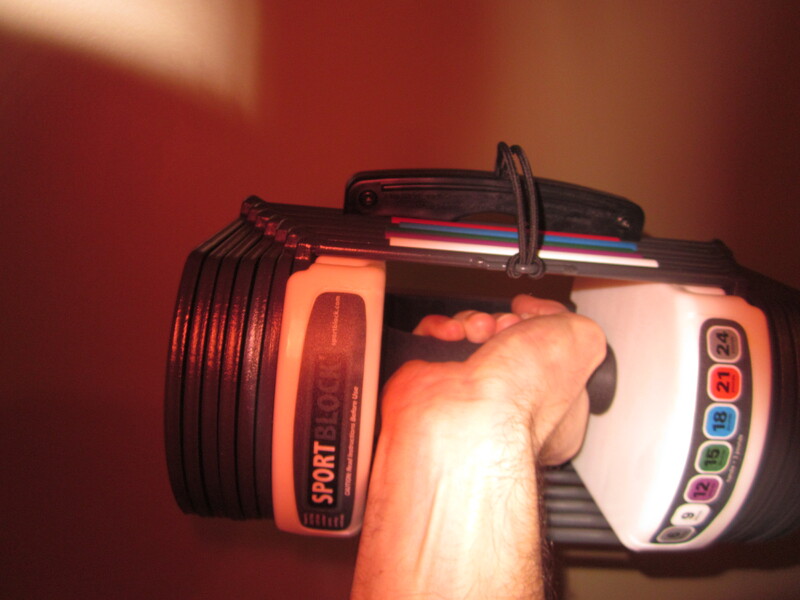 The main reason I got the PowerBlock was because the lightest version of the BowFlex is much heavier and more expensive than the lightest PowerBlock, and the PowerBlock was on sale at the time. Back then when I was comparing products, I didn’t believe I needed to lift 50 lbs(22.6 kg), but I was wrong, since it would eventually feel like I was lifting feathers when lifting the PowerBlock Sport 2.4 at maximum weight. 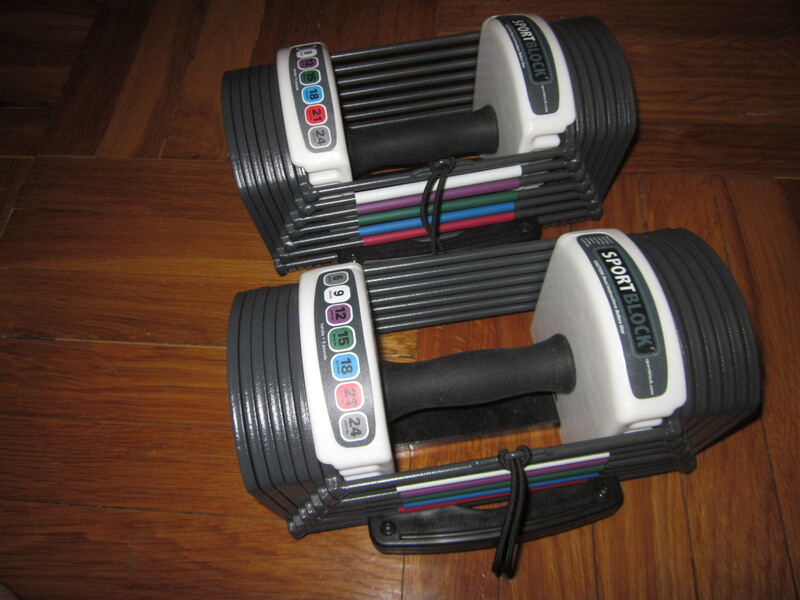 Several months after purchasing the Power Blocks, instead of getting the heavier PowerBlock Classic(50 lbs each) or BowFlex, I settled on much cheaper resistance bands. Quickly adjusting the PowerBlock’s weight is simple enough if you have an IQ higher than a rock. 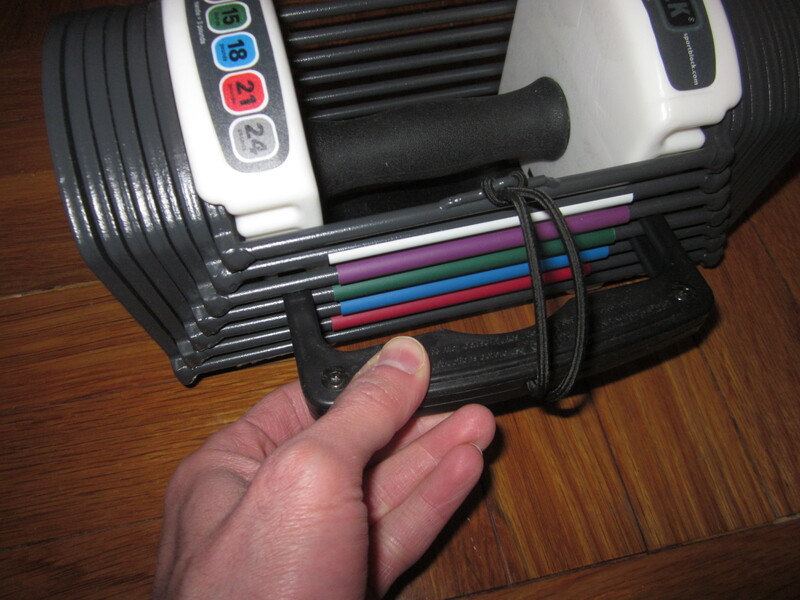 You just put the long selector pin into the desired color-coded weight slots so you end up grabbing all the weights you want to lift(the default position of the selector pin is at the bottom, which allows you to lift the entire unit). You may occasionally have trouble putting the selector pin into the right slots, but it shouldn’t be a big headache once you get used to it and use it on a hard, level surface. The color-coding is a good feature, though it seems the color-strips could easily come off. A more serious flaw is that the welding where the bars are attached to the side weight plates seems a bit unfinished(observe the space between the plate and bar in the picture). 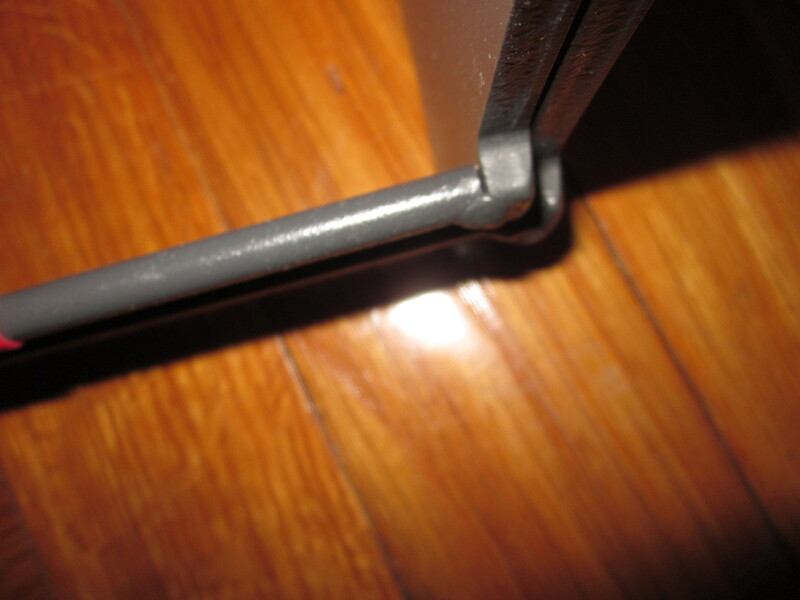 Although it feels sturdy enough for now, it seems with enough usage the bars may become detached. I only occasionally use the Powerblocks these days, since they don’t provide as much resistance as my set of resistance bands. The main advantage of the resistance bands is their portability and that they can be used for leg-strengthening. A big disadvantage of resistance bands is the difficulty of knowing how much weight you are pulling, since it can change a lot with how you position them. Resistance bands also do not last more than a few years. A common concern some people(myself included) have about the PowerBlock is that the weights may come lose while doing exercises with it, resulting in serious injury. So far, this has never been an issue for me, though it does seem like a possibility if they are not locked in properly. Always make sure you lock the weights in properly with the selector pin before lifting. If you are not a bodybuilder, the PowerBlock Sport 2.4 Dumbbell should be sufficient for building strength, along with good old calisthenics. You can find some good deals on Amazon, which is where I bought mine. Since I am a joggler and not a bodybuilder, my upper body muscles only need to be so big, but this doesn’t mean that strength-training is unimportant to me. Strength-training 2 to 3 times a week makes it easier for me to juggle for long periods of time. Also, strength-training doesn’t just build strength, it may also be helpful for diabetics and prevent or treat other diseases related to aging. I believe a fitness routine is incomplete if it doesn’t include strength-training, besides coordination-training and brain-fitness which Wild Juggling also emphasizes. This entry was posted in equipment, exercise, fitness, health, joggling, Juggling and tagged adjustable dumbbells, benefits of weight lifting, bodybuilding, Bowflex, Bowflex adjustable dumbbells, calisthenics, diabetes, dumbbells, injuries from weight lifting, muscle, muscle building, PowerBlock, PowerBlock dumbbell, PowerBlock review, PowerBlock Sport 2.4 Dumbbell, resistance bands, resistance exercise, weight lifting, weights. Bookmark the permalink. I’m sure you would get a lot of use out of them. I’ve had my mine for about 6 weeks,and these work for me.